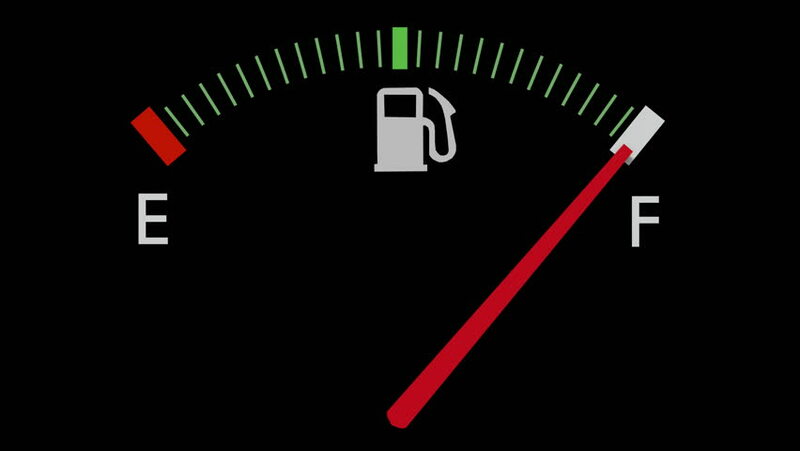 Have you ever noticed how much nicer you fell after you’ve filled your gas tank full? Gas prices being where they are, I have been able to have that ‘satisfied’ feeling a lot more often. Something about seeing that needle on “F” gives a feeling of fullness, security, and satisfaction. Paul wants them to be FILLED UP with the fullness of God! To be ‘filled to the rim’ with the abundance of God’s love, God’s power, God’s holiness…so that we would know Him fully, and reflect Him fully in all our lives! It is a picture of abundance, blessing, fullness! …and it’s God’s will for all His children, through faith in Jesus Christ. In contrast to that think of what most of us experience in our faith, most often. We ‘occasionally’ get a ‘whiff’ of intimacy with God, we sometimes feel moved in a service, we might once-in-a-while be ‘stirred’ by the Holy Spirit in a moment of prayer or worship…but for the most part, our walk with the Lord is mundane, predictable, and honestly, not very ‘transformational’. Yet, Paul prays that they…and we…would be “filled to the measure of all the fullness of God”! God’s promises enable us to ‘share in His divine nature’…”everything we need for living a godly life”. Yet, many of us are ‘running on empty’. We don’t hunger and thirst for Him! We’ve learned to satisfy ourselves with the ‘stuff’ of this world, rather than hungering for intimacy with God. We’ve ‘filled up’ on junk, rather than allowing ourselves to experience real ‘hunger’ for God. We’ve become ‘full’…even ‘overstuffed’ with the pseudo-satisfaction this world can give, and have told ourselves that our relationship with God is ‘as good as it’s going to get…until heaven’. God wants us–by His grace, through Jesus Christ, in the power of the Holy Spirit–to experience the FULLNESS of the full measure of God! Maybe we need to get ‘thirsty’ again. Perhaps we need to get ‘hungry’. This week–today–ask the Holy Spirit to give you a hunger and thirst for God. Ask Him to help you be no longer satisfied with the stuff of this world, and spend some time in prayer and worship, asking the Lord to bring you to LOVING HIM with a passion again. Let Him fill your tank, to the rim. He may just go further and ‘overflow’ it…and blow your mind! We live in the United States of America…but it seems that there’s more ‘division’ than ever before! We are a nation of ‘Us vs. Them’s’, and we each tend to think that we are the ‘right’ ones, and those who disagree with us are simply wrong. You name the issue: Global Warming/Climate Change; Economic Strategy; Abortion; Sexuality; 2nd Amendment…the list could go on. Question: Why has the ‘climate’ gotten so divisive? What has happened over the last 20 years or so to change things like this? We used to be able to have discussions and even disagreements, but we’d often be able to come together in a ‘workable’ solution. Now the only ‘workable’ solution seems to be if I change my mind and agree with you…or vise verse. Personally, I think that one of the reasons for this divisiveness is a lack of humility. We have simply lost the ability to say ‘I don’t know everything about this’, or to take the posture of learning from others–especially those we disagree with. A related development is our refusal to tolerate people who disagree with us. Now we seem to have reached a point that, if you disagree with my point of view, I must seek not only to ‘convince’ you, but (if unsuccessful at that), I will seek to punish you, to embarrass you, shame you and drive you away. There is a remarkable lack of graciousness and maturity. There is a remarkable lack of humility in our culture today…and it is found in both political parties, to be sure! Another Question: Is there anywhere that we can see a better example? I believe there is, and it is in The Church. By ‘The Church’, I am not speaking of a denomination, nor am I speaking of a religion. I am speaking of a group of people who have found New Life, by faith in Jesus. As part of that New Life, they are being made into a ‘New People’–the Church–that is learning to accept one another, encourage one another, and love one another. It happened back in the beginning of the Church age, and it continues today. As we at KCC (http://www.mykcc.org) discovered last Sunday, Paul wrote to the Ephesians about the amazing way that God was bringing 2 groups of people who hated each other (or at best, ‘tolerated’ each other) into one group…and even more! “In those days you (Gentiles) were living apart from Christ. You were excluded from citizenship among the people of Israel, and you did not know the covenant promises God had made to them. You lived in this world without God and without hope. Paul writes that the Gentiles–formally ‘unclean outsiders’ were now welcomed in because of Jesus. HE has made peace between us all. HE has made possible our entrance into The Faith, and HE is the One who changes our lives. God has welcomed us into His Family because of our faith in Jesus Christ. Why would The Church be able to consistently do this? Why would true faith–all inclusive faith in Jesus–make it possible to not only ‘tolerate’ those I used to hate, but to ‘accept’ them, and even ‘LOVE’ them? Why would my faith in Jesus enable me to CELEBRATE them? Because all of it is ‘by Grace, through faith, in Christ, alone’ (see Ephesians 2:1-9). Before I can come to faith in Jesus, I must humble myself–there’s no other way. If I am going to see my need clearly, I must humble myself before God and confess my sin, before I can receive His forgiveness and salvation. As I do, I realize that it is not my ‘goodness’ of any kind that brings me into ‘The Family of God’–it is wholly His grace and mercy. Once I’ve truly experienced that, then I am changed. I am humbled. From that point onward, anyone who truly comes to Jesus in humble, repentant and life-altering faith, is also ‘welcomed’ into the family of God, and should be welcomed by me! Are you a ‘Climate Alarmist’? Are you a ‘Progressive liberal’? Are you a person of another race/ethnicity? Are you a ‘Pro-Abortion advocate’, or a ‘militant LGBTQ activist’? Are you a ‘Gun-grabbing liberal’? However, if you are one who has come to faith in Jesus Christ–humble, life-changing faith, and you are willing to sit with me and worship Him, to study His Word and pray for each other, and to ask the Holy Spirit to guide each of us in submitting ourselves to Him and following Him, first and foremost, then I believe–as challenging as it will be–that we can have real ‘fellowship’ together. I will do my best to ‘accept’ you and ‘love’ you! …and perhaps, in so doing, our culture can learn something from The Church again. The key: Not ‘Unity’ by itself; but ‘Unity In Christ’! It is only through humble faith in Him that we receive His grace, and therefore can give His grace. Is it possible to have ‘unity’ in our culture? I’m not sure…doesn’t look very promising. Is it possible, however, to have ‘unity’ in the Church? Yes–IF we are willing to humble ourselves, pray, seek His face and turn from our wicked ways (see 2 Chronicles 7:14)–each of us–then He will bring us to unity, and HE will be glorified! Can we do it? The early church did, because God brought them to it…are you willing? Have you ever wished you could go back and start something over? Maybe a diet, a budget, an exercise program…maybe a conversation? If only you could call a ‘time out’, and go back to the beginning. Then, knowing what you now know, you’d start better. You’d be more consistent, more committed, more faithful, more attentive. Sometimes, unfortunately, we can’t do that. The opportunity has simply passed us by, the possibility is no longer there, or the other person(s) are not open to it. The great news is that, with God–through Jesus–the possibility IS there–always! “I know all the things you do. I have seen your hard work and your patient endurance. I know you don’t tolerate evil people. You have examined the claims of those who say they are apostles but are not. You have discovered they are liars. 3 You have patiently suffered for me without quitting. Despite having good theology and being a ‘solid’ church, they’d forgotten one very important thing: Their love for God! They had rules, they had theology, they had strict adherence to God’s Word–all very good things; but they had ‘lost their love for God’. What does theology with no love for God lead to? Dry, crusty, legalistic, harsh, punitive ‘religion’. I believe this to be THE problem in the lives of many Christians today. Many Christians, who fill the pews of many churches, have forgotten the importance of keeping a LOVE FOR GOD alive–that relationship has to be the driver behind what they do. Their love for God must be the ‘Why‘; their obedience is the ‘What‘. If we forget the ‘Why‘, and only have the ‘What‘, we are in danger of becoming like the Ephesian church. Something inside of us knows that is not the way it’s supposed to be! The Holy Spirit shows us that we need Him, and we want to be closer to Him! That’s why many of our church responded last Sunday to a call to repentance and asking God to ‘renew our passion’ and ‘Revive’ us. We want to be close to the Lord, and to have Him lead us into the joy of knowing Him closely, reflecting Him more. We want to move closer to Him every day, and our hearts ache to have that intimacy with Him. How do we change–once we realize we’ve gotten off track? First, we get an accurate look at ourselves, admitting ‘how far we’ve fallen’, then we ‘Turn back to [Him]’ (repent), then we ‘do the works we did at first’. If we want to experience ‘Revival’–in ourselves as well as in our churches, we must Honestly acknowledge the things that have taken us away from Him–our hobbies, our pursuits, our interests, our comforts…even those things that aren’t ‘sinful’ in themselves may have been some of the very things that have stolen our love from Him. We must then Turn Back–REPENT! We must turn back to Him in a very real, practical, lived-out way. We must refuse to make excuses or to blame others, but must instead take responsibility, seek His forgiveness, and commit to following Him! Finally, we must ‘DO’ things…we must make the priority decision to seek Him…spend quality time in Prayer, seeking His face; spend time in His Word, studying and meditating on it; seek Him in prayer. We must pray–not about our ‘lists’ of people and issues, but about Him! We must spend time simply ‘seeking His face’, and being humbled there. IF we are willing to do these things, He may restore us and revive us. If we genuinely seek Him, He will not turn His back (see Luke 15:11-24). As the Scriptures say, “The faithful love of the Lord never ceases. His tender mercies are new every morning! Great is His faithfulness!” (Lamentations 3:22-23). Christian, don’t delay! Take time today to restore that relationship with God. Admit your distraction and sin, repent and turn to Him, then do the things you must to get close to Him. Ask Him to ‘renew’ and ‘revive’ you, and share what He does with others! Then our lives will work the way they’re supposed to, and then He can and will use us to spread the good news about Jesus to others…and our world will notice again! You’re never too far gone! What is it that you pray about? If you’re like most people (including myself), you pray about specific concerns or issues in your life, in the lives of those you love, or in this world. You ask God to ‘come through’ in some way for you. Very often, these are ‘legitimate’ prayers. God wants us to go to Him authentically, sharing what is really on our hearts, and asking Him to move. Do you ever pray about your ‘spiritual health’? Do you pray about your relationship with Him–that it would get better? As we just discovered at KCC last Sunday, the Apostle Paul had prayed for those at Ephesus for years…he had “not ceased” to pray for them. What did he pray for? He prayed that they would “know Him better”. More than anything, Paul prayed that these people he loved would get ‘closer’ to God and know Him better. Why did he pray that? Because Paul knew that God–as God–deserved the Primary place of Prominence in their lives. Because Paul knew that ‘Knowing God more deeply’ would lead to a life that ‘worked’ the way it was supposed to. Because Paul knew that this relationship with God–a growing, vibrant, deepening one–would lead to the experience of blessing that God had already given, but that they had not yet ‘experienced’ (see vv. 18-20). Because Paul knew that an individual’s relationship with God must continue to grow and deepen if it is to continually be transformational. Paul knew that this was God’s plan for each individual, and that all of the blessings that were promised (see Ephesians 1) would flow up from/out of our vibrant relationship with Him, so he prayed that they would know Him ever more deeply. At KCC, we talk about ‘…passionately pursuing an ever-deepening relationship with God’. THIS is where this thought comes from. As we make that deeper relationship with God our highest priority, we seek Him more in study of His Word, in prayer, in worship…and as we get to know Him more, we are transformed and made to experience the blessings He’s already given us. That was Paul’s desire for the church at Ephesus. That is my desire for KCC, and all my Christian brothers and sisters. That is my desire for myself. Are you ‘thirsty’ for more of Him? Are you ‘hungry’ to know Him more? Let’s make that the point of our prayers, and see how He changes us!